Words can get us into trouble even when we don’t mean for them to. Many times there are perfecting linguists who have this thought in mind and demand exactness when speaking. 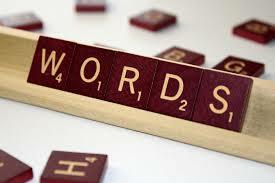 The right words, the right order, the right intonation, the right pronunciation — all to convey a thought or message. It’s frustrating when dealing with people who want to nit-pick every little detail. The purpose might be to make sure you have a clear understanding of your thought and are conveying it just as clear to the listener. But most of the time it comes across as some arrogant knucklehead trying to prove they’re superior in intellect. It drives me crazy. Here’s an example: Jesus loves you as you are. Does He? It depends on the context of the conversation, but for some that’s not even enough. Here was the context when I said it: Jesus doesn’t expect you to get cleaned up and acting right before He’ll accept you into His family. You’ll never be able to be good enough, smart enough, rich enough, clever enough, or clean enough to receive His grace and mercy. So don’t wait around thinking you’ve got to change your life around first before receiving what God has for you. And to follow-up on it, I gave this addendum: After you come to the Lord, He also loves you enough not to leave you where He found you. We’re commanded to forsake our old ways and follow Him. He’ll change you from the inside out and give you a new heart that desires to be obedient to the Lord out of a love that was non-existent before surrendering your heart to Him. Almost everyone would declare that statement and its addendum are accurate. Then I met this legalist; a modern day pharisee who decided to nit-pick every word. How dare I tell the unsaved that God loves them just like they were. Holiness can’t be in the same room with unholiness. Light and darkness do not live together. God can’t stand to be around sin and obviously apart from salvation sinners have sin in their life. So God can’t stand them. He could go on and on quoting verses of how God abhors sin and sinners are an abomination to God. But that’s just half of the truth. I look at John 3:17 and Romans 5:8 and see the merciful side of God. It’s the side that extends mercy to those who don’t deserve it and grace to those who could never merit it. It’s His love that reaches the unreachable, loves the unlovable, and calls lost sinners to salvation. It’s frustrating enough to deal with shysters in the world, but when you get word-picking preachers who act more like lawyers than gospel declaring Christ followers, I want to pull the rest of my hair out. How in the world can you reach the lost if you’re confusing them even further by telling them it’s His grace that saves them and yet heap shovels full of law on them before they can even be considered worthy. That’s counter to God’s word and corrupts the gospel to a distorted message filled with garbage. I sincerely believe they do it out of a desperate need to feel superior to anyone. Sorry, buckos, you just proved you’re not and you did it with an abundance of arrogant flair. The gospel, when delivered in its purity is good news. Jesus lived a sinless life, took our sins and the penalty for them upon Himself, and rose again on the third day. If you declare with your mouth Jesus is Lord and believe in your heart God raised Him from the dead, you are saved. It’s that pure. God does all the work from the first to the last and we can do nothing of our own to earn it. It’s a free gift He offers to us. The works that occur after our conversion testifies of His hand in, on, and through us by the power of the Holy Spirit. The bottom line is this: God so loved the world He gave His only Son so we might receive eternal life. That gift is to anyone and everyone who will truly call on His name from their very point of despair. Jesus reached out to the common man and woman; fishermen, tax collectors, fathers, brothers, mothers, sisters, harlots, and whores. The ones that had problems with His message were those legalist preachers of His generation.